Like most small business owners, franchisees experience times of frustration and lapse of motivation, often exiting the industry before they’ve reached their full potential. That’s why Christy Wilson Delk, a successful franchisee, decided to relay her keys of successful franchise ownership to those who are struggling. 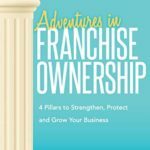 In ​Adventures in Franchise Ownership, Christy shares advice from 16 top performing franchises representing over a dozen market segments. Learn how to run your business more efficiently and profitably all while enjoying doing it. Christy Wilson Delk is a full-time Business Professor at Rollins College in Winter Park, Florida and a contributing franchise industry writer. With over 15 years of successful franchise ownership, Christy has the business acuity to help franchisees stand apart. After earning her BA in psychology at the University of Florida, Christy Wilson-Delk spent 17 years in corporate sales. Not feeling fully satisfied, she began taking night and weekend classes to obtain her M.B.A. Realizing it was time for real change, Christy cashed out her 401K, sold her home, and built a Kids ‘R’ Kids Academy franchise in Orlando, Florida. Christy Wilson-Delk spent the next 15 years running and expanding her Kids ‘R’ Kids Academy franchise. In 2011, Christy realized it was time for the next phase of her life and began her exit strategy. From an initial investment of $240k, she sold her franchise for $6 million in 2012. She attributes her success to her franchisor and to the 4 Pillars Approach that she developed over her time as a franchisee. 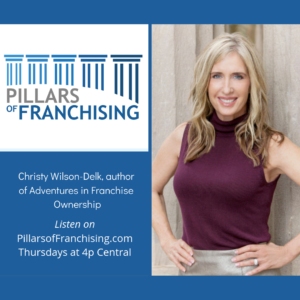 Today, Christy Wilson-Delk uses her cumulative business experience, her franchise expertise, and her book, Adventures in Franchise Ownership, to consult, lead workshops and talks to teach others how to implement their own 4 Pillars Approach to motivate and lead them to higher performance and success.